Dummy cameras. It seems like most people think they are, well, dumb. But it is hard to ignore the impact they have on the security industry with people routinely asking about using them and many deploying them. **** ************ ******* ** *** ********* *** * ******** *** light, *** *** ***** ******* ** ** *** * ******* that ** ***** ** ** **** ******* ****. ********* ****** on ****** *** ******. "* **** ** * *** ** customers ***** ****. * **** ****** ** ********* *** *** adamant **** **** **** **** *** ***** ** *****," ********* said. *** ***** **** *** ********* **'* ****** ** **** the *****, ** **** ****** *** ****** *** * ******** red ***** ** * ******* **** *** ******* ***. "** personal ********** ***** ** ******* *** ******** *****. *** *** people *** ***'* **** *** *****, ** **** **** **** not ** *** ********* ** ****," ** ****. *** ******** **** **************** ** * **** ****** ***** *** flashing *** ***** ********* ** ***** ****** **********. "******* *** ******** * ***** **** ********** **** ** ***** into * **** **** *** *** *** *** ***** ****** to ***** ** *** ***** ** *** ******," *** ***** pitch ****. *** **** ******* ******* ******* *** ******* ********* ******* **** the **** **** **** ************ *******. ** ** ******* *** smaller *** *******, ***** ****** ********* *** ********** ******** *** designs ** **** ***********. *** *** **** ** ***** ****** getting *** **** ********* ********* ** ********** ******* ******. ** ***** $**. "**'** **** ******* **** *** ***** * year *** ****'** ****** **** ***** ****** **** *** **** year **** *** ******* ******* ***. *'* ******** **'* ******* you ***'* **** ** ******* *** *********," ** ****. *** ******* *** ****** **** *** **************** ** *****. **** started ******* **** * ******* ******* ** ****. "*'** ** honest * ****'* ***** **** *** ******* ** **** **** then. **'* *** ******* ***** *** ***** ****'* **** ** the ******* *********** *****'* ***** **** **** ******** ** **. But **** *** ***** ** **** **** **** ** **** with **** *** ** *** **** ** * **** ****** level *******-****. *** ****'* **** ** ****** *** ***** ***** to **** ***. ** *** ********** ******* ******* ** ******* for **** ** *** *** ******." **'* ******* ****** **** **'* **** ******* *** **** ******* "******** **** * *****." **********, ********* **** *** ******* ******* *********** *** ***** ****** market ** ******* ***** ****** *** ************ *********-- *** ***** ** ***** "*******" ******* ***** ******** ********. And ** * ***, **'* ****** **** *** ******* **** first ******** *** ****** **** ** ***** ****. "**** **** *** **** ** ****, *** **** ***'* **** the ******* *** ******* ** *** *** **** ** ***. *** quality ** **** **** ** **** ******* **** ** ***** started. **** ***** **** *** ***** ********. ***** *** ** many ***** ******* ******* "***" ******* ** ****** **** ****'* really *** *******. ********* ***** ****'** ******** *** ***** ** they ******* ** *** ********. **'** **** ******* **** ****** the **** **** ** *** ***** ******* *** *****," ** said. "I ***'* **** ***** ****'** ****** ****, *** **** **** a ***** *** **** *** *******." "**** ** *** ********* * ****** ** **** ****** *** already *** ********* ******, **** * ******* ** *** ****, and **** *****'* ***** ** ** *** *** *** ** expensive ******," ** ****. ****************'* ******** ****** ** ***** ****** ******. ** **** ****** **** ***** **** ** ***** ******* *** motion ****** *** * ***** ******** ***** ******** ******* ** get ********* ******. ****'** ******* *** *** ****** ***** *** add * ************. ** ********, ********** *** **** **-*** ** * **** and **** **** ****-******* **** ******* ** ******* ***** ** strip *****. *** * *** ******* ******* * ****** *** get * ***** **** ******, *** *** **** **** $*** they *** *** * *** ** ***** *******. "** **** ***** what **** ****** ****** **** *** ****, *** ****** *** up ******* **** *******," ** ****. ********* **** ***** **** ** ******* *********** *** ** ******* businesses *** **** ****** *****, *** **'* ****** ** **** where **** ** ***** ******* *** ***** *** **** **** have * ******** **** ******. * **** ***, ****** ********* Shoemaker *** *** ********** ** ******* *** * **** ** buy ******* ** ****. *** ****** **** **** ** *** inventory, ********* ****. **** ** *** ***** ** *** ******** are **** ** ****** ******** *** ****** ** ******* **'* selling ** ****** ** *** ******, *** ** **** **** have ***** *** ******** * "**********" *****. ********* **** **** **** ***** ******** *** ****** **** ******* or ********** ******** **** ** ***** **. ********* **** ********* ***** *** *** ********* ********* ***** ***** cameras **** ** *** *** ******, **** *** ****** **** would ** ** ********* ******** ** ***** ** ***** "*******" that **** *** ********* ** **** ** ** ** ******* contacted **** *****************. ***** ******* ****** ** *** ******** ******** ** **** ***** cameras ******** *********, **** *** *** ** **** * ***** case ***** * *********** ******** *** ******* ******* * ***** camera ****. ******, ********** *** ******* '**** ***** * ***********'****. ** ***** ******* **** *** **** ********* ****** ** **** cameras? ********* **** ********** (****** **** **** ***** ** ***). UniquExceptional's ****** ***** **** "**** *** **** ************* ********* **** think *** ******* ** ******* ** * ****-**** ************ ****** and ** ** ****** ** ** ****** ******." "******* ******* *** ********** ********, * ***'* **** *** ****** could **** **** **** ****'* ****. *'* ********** ******* ******* in, *** ** *** ********** ****** ** ****** *** ******* to **** ******* ****** **** ****," ** ****. *******, *** ******* **** *** ***** ******, *** ***** *** lack ** *** ******* *** *** *** ** *********** ****** that * ****** ** * *****. ******, ******* **** ******** red ****** *** **** ****** ** ** ***** *******, **** if ***** **** ****** ***** *********. *****, *** *** ******* that **** **** *** ***** **** ****** ** ********. * novice ******** ***** **** *** **, *** * **** *********** one ***** ******** ** ********** ********* **** *** ******* *** not ****. *** ** **** **'* **** ****** ********* *** ** ****** dummy *******. "** ***** ** ********* ********** ********* **** *** over, **** * **** **** **** **** ***** **** ** spend * ****** **** *** *** **** **** ************ **** for ***** *** ******." ********** ** *** *****, *** ** there ** ********* ***** ******* ***** ******** *** ******** * repeated *******, **** ******* *** ******** **** *** *** *** job, ** ****. ** *** **** *** ********** ********* ***** *** ******** ** dummy *******, *** ** **** ** *** ******** ******* *** we **** *** **** ********. No disrespect to Shoemaker, but a dummy camera vendor griping about his competition's poor quality is rich. Do fake Rolex vendors admonish each other when they 'are not fake enough'? That was really good of Mr. Shoemaker to offer his insights. Who other than Mr. Shoemaker might have made this comment? Same people who provide 5 star rating on web sites without owning the product?? The comment you were referring to was made by a regular IPVM commenter and experienced integrator. I enjoyed the dummy camera interview as well. Listen, he's not going to sell any by speaking to IPVM but at least we know how more about what makes him tick. You ignore your competition at your own peril. The wise person welcomes any insight they can get. Mr. Shoemaker did not have to have to consent to the interview. We're as much his competition as he is ours. Someone should makes dummy cameras with real covert cameras in them to catch the more experienced criminals. I guess I should add blinking lights to real cameras? Or add dummy ones in the same room as real ones? Here's an interesting story from yesterday about how a man's attempt to make a dummy camera look real backfired. With all due respect, averaging nearly a perfect 5 stars, means very little on those sites as these numbers can be fudged and falsified. I agree with a previous comment about this gentleman taking exception with cheap knock off’s. That is exactly what he later admits to with coping real cameras. I personally believe he is providing a disservice to our industry. If they faked anywhere close to 500+ nearly 5 star, they should stop selling dummy cameras and go full into search engine / reputation manipulation. Because such fakery, at that level, is immensely hard and crazy lucrative. If people did not like their cameras, you would not have 297 5 star and 130 4 star reviews with only 25 1 one star ones. I could understand if a review had 5 ratings, sure. But 500, no way. Even if a handful are bogus, overwhelmingly those are certainly real reviews. He is almost certainly providing a disservice to 'our' industry, but it would be foolish to dismiss the reviews as gamed. You don't think there are bogus "services" that can assist you with number fixing John. 500 is not that much in my opinion. How long have they been in business would be a better benchmark of success. You can try to add fake good reviews, but you cannot remove real bad reviews. That there are only 25 1 star reviews out of 500 is a positive sign. Secondly, this is one of the very top selling products in Amazon for surveillance, meaning that there are a lot of people buying (I'd bet easily tens of thousands a year). Even if somehow all the 5 and 4 star reviews were faked (impossible), that there are only 25 1 star reviews is a very bullish sign given its level of sales. There are dozens of Amazon verified purchasers who are giving this 5 stars who have reviewed lots of other products. Those reviews are especially unlikely to be faked because of the complexity of setting up so many accounts, buying products, reviewing other products, etc. You evidently strongly object to this product but you are vastly misunderstanding the complexity and challenge of orchestrating such a fake review campaign. Crap. I guess we better turn off the flashing red LEDs on the faces of our Mobotix cameras! 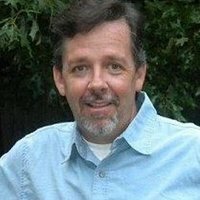 John, thanks for your comments as always a good discussion and opinions on a topic. I enjoy these almost as much as the articles themselves. I am not about to labor over the 5 star rating a business has and how they managed to get it. fair to say we disagree on this point. The comment on how long a business has been around who made without explanation. I simply mean that this can be a factor in determining if a person does buy from a business. NOT the only reason but a piece in the overall decision making process. I actually enjoyed this read and do have people ask me about fake cameras. When considering a camera system people almost always ask for my thoughts on them. Maybe I am just jealous that I did not think of this first! Seriously, though, it fluctuates. When Carlton was preparing this last week, it was at #2, it evidently dropped to #3 a few days ago and now is back to #2. The question that bothers me is: "Why is there so many reviews of this particular dummy camera?" There's no other dummy camera even close. Is it that much better than the others? For a dummy security camera, I'm sure this particular camera 'works' about as well as any of them. And I wouldn't expect there to be a whole lot of 'middle' star ratings for any dummy camera - either it looks like a camera and hangs there, or it breaks and it don't. Not much nuance. 5 or 1. Based on this cameras % of 5s to 1s, we can assume it at least hangs there, looking at least marginally like a real camera. So why does this particular dummy camera have exponentially more reviews than any other dummy camera Mr. Shoemaker sells (they show 41 different models listed on Amazon)- or any other dummy camera on Amazon for that matter? This cameras first review was in early Feb 2011.... it's been on Amazon for awhile. In it's first 7 months, it garnered a total of 21 reviews, and by the end of 2011 had risen to 43 reviews. By June 2012, they had added only 50 more reviews for a total of 93 reviews in it's first 18 months. There was a very slight increase in reviews from July to October 2012 (from ~8/mo to ~10/mo), then in November 2012 the 'reviews per month' figure doubles to 20. December 2012 - 25 reviews, January 2013 - 35, February 2013 - 36..... it's around ~50/mo currently. 200 of the 500+ reviews for this camera have been generated in the last 5 months - after it having been available on Amazon for ~30 months. There is much debate online about the trustworthiness of 'customer reviews'. Primarily because there are many ways for companies to try and 'game' this system. One of those ways (amongst others) is to simply identify buyers who 'like to review stuff' and ask them if they can send them their product if he/she would simply provide feedback via a review. NOTE: The article I linked to does not mention the 'Amazon Verified Purchase' label showing that the review was from someone who actually purchased the item that's being reviewed on Amazon. However, and I'm not saying it 'was' done, but simply that it 'could' be done; A promise to refund the purchase price after review is submitted (whether the product is actually returned or not) would have a lower response rate, but it would still generate reviews. People who receive stuff for free will almost always give a positive review - if it aint complete junk. The only study of Amazon reviewers that I could find was this one. They sent requests to all 1000 of Amazon's Top 1000 reviewers and got responses from 166 of them. It's a long report, but a good read. 1. Solicitation of Free Products - 85% of our respondents report being sent free books or other products to review by publishers, authors and the like. This is an important finding because it shows that Amazon top reviewers do receive some sort of direct mail reward, however small, for their endeavors. 2. The median age group of the Top 1000 reviewers is 51-60. Back to the camera in question. If we profer the given that this camera is at least as good as the others of it's kind, and that it will most likely perform to the expectations of someone looking for a security camera that aint really a security camera, then simply generating lots of reviews can help push that particular product onto the 'best of' lists.... especially if there is no other similar product with near as many total reviews. Also, none of the reviewers of this camera in it's first 19 months on Amazon exhibit these buying patterns. One other thing. If you click on 'See All 500+ Reviews' and sort by 'Most Helpful' (the default), notice that it is stacked hard with 'Helpful' reviews from 2011. Also, note the very high 'likability quotient' of these early, 'helpful' reviews (i.e. large percentage of total 'read' reviews saying it was 'helpful'). No review during the recent 'review explosion period' has near as many total 'reads'). Thats my 2 cents. I am no expert, nor am I insinuating anything of any kind by any party. The number of reviews are entirely consistent with other top sellers in this category that include 1,000, 3,000, 794 and 860 reviews. What really bothers you is that's it a dummy camera. "I'm not saying it 'was' done, but simply that it 'could' be done; A promise to refund the purchase price after review is submitted (whether the product is actually returned or not)"
Wonderful, so you have no evidence but simply want to smear the product. Nicely done. "But here are ten people who rated this camera 5 stars (within the 'review explosion period') who all appear to review lots of differing/disparate products on the same date:"
Those people overwhelmingly are marked 'Amazon Verified Purchasers' for each item they reviewed, meaning they bought them from Amazon. So unless you are insinuating that this broad array of companies / products are all offering refunds for reviews, you are out of luck. Also, you have no evidence, but don't let that stop you. "notice that it is stacked hard with 'Helpful' reviews from 2011." Sigh. That's because 'helpful'ness is based on the number of people voting whether a review was helpful. Of course, older reviews have been there longer and tend to get more reads and more votes. You will find the same pattern with most product available for a few years. I'm not attempting to 'prove' anything. There is no way for me to do so. If anything, I have more questions than answers. There are many, many stories out there questioning the validity of Amazon reviews (even after they added Amazon Verfied Purchase) - specifically 5 Star positive reviews (read the comments below this NYT piece). The $$ to be made by being at the top of these 'lists' is significant. IMO, just because of that, people will try and game them. There are many, many entities that exist to 'help' companies with reviews for a flat fee (avg ~$10/ea) - like these guys. And these guys will give you Amazon Verified Purchaser reviews for a larger fee. "The number of reviews are entirely consistent with other top sellers in this categorythat include 1,000, 3,000, 794 and 860 reviews." 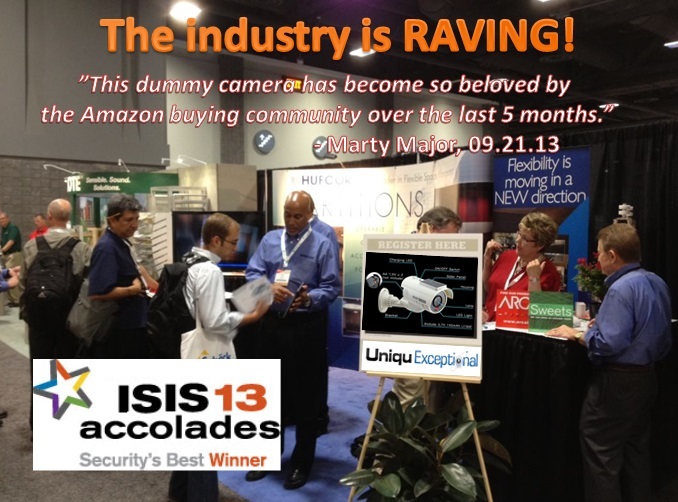 You are using the category 'security camera' to compare; I was referring just to other dummy security cameras. The next closest dummy camera (in total reviews) doesn't even crack 200 - with only 2 or 3 anywhere close to 200. Why? None of this sellers other 40 dummy cameras are reviewed at anywhere close to the rate of reviews for this one camera. Why? The bulk of this cameras reviews have occurred in a recent, short period of time over the life of this camera being sold on Amazon. Why? These are all questions I can not logically answer. The #1 camera looks far more realistic than #2 and costs just $4 more. It's not incredible to imagine that people would be happy to spend $4 more to get a camera that looked real, to scare more people. And in most markets, the #1 product sells a lot more than the #2 product and would expect to get a lot more reviews. Maybe it's a better dummy camera? Maybe people actually find it useful? I guess that's simply impossible for you. You could not make a credible case directly against the reviews posted being fraudulent, and that's the bottom line. The world's first (and probably only ever) dummy camera shootout is on. I just bought 8 dummy cameras for the grand total of $74.77, including shipping, from Amazon. Derek, have at it. Let's mount them side by side and next to real cameras to see how realistic or not they look. Take a few videos, gather some recommendations and post on the site. For the same cost of these dummy cameras I have hundreds of real cameras that just don't work or don't work well any more. Maybe we should start a real camera gone bad aftermarket sales site? That will really throw the experienced criminals for a loop. This same Amazon seller also has an ebay store. Interestingly, of the 76 items they list on their ebay site (all also available on their Amazon site), guess which item isn't there? 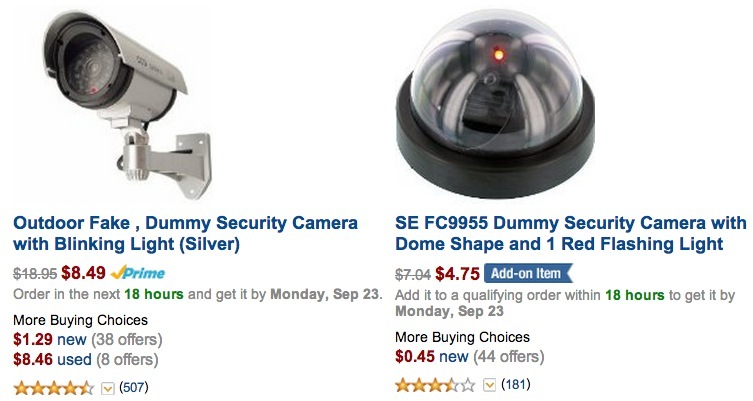 You guessed it - no 'Outdoor Fake, Dummy Security Camera with Blinking Light (Silver)' - their huge seller on Amazon! (1) I did not guess this. (2) It's on the ebay store - available in black for $10.60. While it is somewhat similar, there are differences in the housing - I don't believe it is the same camera just in another color. However, even the UniquExceptional UDC4black - Outdoor Fake , Dummy Security Camera with Blinking Light (Black) is listed on their Amazon site too - 63 reviews. Here's another mind-blower: Their #2/#3 best-selling camera on Amazon isn't even listed on this sellers own home page! Wow, you're right! That's highly suspicious! If this particular camera was so outstanding compared to other dummy cameras - as the amazon reviews are supposed to lead us to believe - wouldn't we also expect to see evidence of this 'better than other models' sales outside of Amazon too? The better conspiracy theory is that the dummy manufacturer negotiated some form of exclusive for Amazon, whereby Amazon promoted this more heavily, leading to more real reviews, rather than a phony review campaign that Amazon got fooled by. The same camera (with UniquExceptional logo) is here, here and here. The same camera (no logo at all) is here, here and here. So I am lost now. Are you still claiming the reviews are fake? Or have you given up on that angle and are now pursuing something else? To clarify: I'm not claiming anything other than I don't understand why this dummy camera has become so beloved by the Amazon buying community over the last 5 months. Nothing I have found has indicated to me that this particular dummy camera is all that different from any other dummy camera. Clearly some are 'better made' than others. But with the litmus test for this type of thing being only, "Does it look real and not fall apart", I fail to see how one camera can do this so much better than the others to prompt so many more reviews. Even if this was the case, and UniquExceptional was the mac daddy of all dummy camera makers, I should be able to find evidence of this beyond one site's reviews, or having the same maker have other big-selling cameras. I am looking for supporting evidence for the gargantuan number of favorable Amazon reviews in comparison to other like devices, and I can't find any. From the beginning of this exercise, as soon as I saw this dummy camera with so many more reviews than any other, my only question has been - "WHY?" My theory: It's the highest selling dummy camera so that's why it has the most reviews? And I bet the reason it's not sold other places is probably because of their contract with Amazon. Having read the last few postings, I now feel like a dummy. I'm with you, Tom - I skimmed the thread, thought about posting a couple times... now all I can think of is a variation on that old anti-drug slogan: "It's called DUMMY for a reason." I did find the bit about dummy cam "quality" entertaining, and the "real" dummy cam manufacturers complaining about "cheap knockoffs" infinitely amusing, in a pot/kettle sort of way.